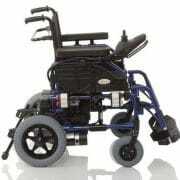 The aluminuim folding structure makes this electrical wheelchair the best aid for elderly and disabled people. ARE YOU INTERESTED IN PURCHASE? 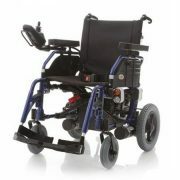 The folding aluminuim frame makes the Escape DX electric wheelchair ( model Ardea Mobility by Moretti ) a perfect fit for daily and elderly mobility. Upholstered black backrest and seat in nylon, completed with seat belt. Height adjustable armrests, foldable and removable.Footboards with adjustable foot height , foldable, complete with heel strap.Available in 2 sizes ( 41 or 46 cm ). Excellent for tourist mobility in the centre of Rome.